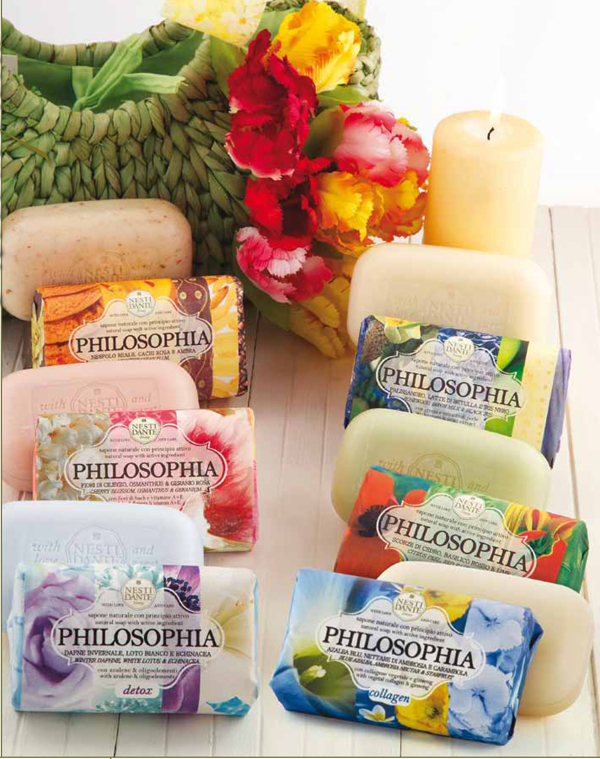 The love for the beauty that nature has to offer us, an insatiable joie de vivre and the constant search for balance in the benefits are the inspiration for PHILOSOPHIA, a line of natural soaps prepared with love and care by Nesti Dante, using an entirely artisanal process from start to finish. The soap paste is obtained from a long and complex process of boiling in a cauldron, which lasts four days and requires the constant presence and meticulous intervention of master soapmakers and perfumers. This process does not alter in the slightest the essences, rich oils and functional substances of top quality in the formulations - which are also without synthetic surfactants. The soft perfume of a medlar in the sun and the sweetness of pink persimmons are the suffused background to the gentle exfoliating action of bran and walnut granules; its pulverized shell delicately eliminating dead cells and restoring natural luminosity. This process increases the vitality of the cells and their renewal, giving a youthful, healthy and compact appearance for happiness on the skin’s surface. The intense accords of rosewood are interwoven with black iris for seductive notes enriched with moisturizing cream and pearl extract for a velvety smooth and sensual skin. Body care becomes a daily ritual that infuses pleasure, whilst the skin benefits from the moisturizing properties of the cream and the soothing action of the milk. The enchanting profusion of cherry blossom and the rejuvenating action of A + E vitamins help to get a firm and smooth skin. The sweetness of pink geranium, together with the purifying flow of bach flowers, fill the mind with joyful memories and intense motions. A fragrance of citrus zests, red basil and lime envelops the precious active ingredients of chlorophyll and bamboo lymph with stimulating and relaxing virtues to offer the skin a paradise of fresh emotions. An invigorating cocktail that combines efficacy with the gratification of the senses, leaving the skin toned. feeling smooth and deeply regenerated.